Now the ceiling on the second floor has been dry walled and the attic access stairs put in place, a team workers filled the attic spaces with insulation. The insulation is delivered through a large hose that is fed from a truck parked in front of the house. 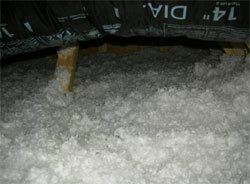 The insulation comes in easy to empty bags that are dumped in a hopper and blown through the hose to the attic space. The crew placed depth markers along the attic's joists to indicate the proper level to fill the insulation to for the correct R Value, or insulation value. Styrofoam barriers were placed at the end of each rafter to prevent the eaves from filling or becoming blocked by the blown in insulation. As your attic warms up, the warm air rises and exits through the attic's ridge vents at the peaks of the roof. Cooler outside air is drawn in through the eaves vents of the house and a steady circulation occurs. The insulation layer prevents most transmission of heat or cold from the floor below. Prior to the installation of the insulation in the attic, there was a noticeable 10-15 degree difference between the first and second floor of the house, depending on the weather outside. After the insulation was added, the difference was negligible, if not undetectable on cool days. There are two ways by which you can classify home insulation-- by what it is made of or by what form it takes. You may already be familiar with what home installation is made of, the cheapest of which is fiberglass. Hence, this article will discuss the different types of home insulation available according to form. The most commonly used type of insulation is blanket insulation. Available in batt or roll form, this type of insulation consists of mineral fibers, which give it flexibility. Manufacturers usually use fiberglass in making blanket insulation, but they also use mineral wool, such as rock and slag, natural fibers and plastic fibers. Whether you get batts or rolls, you will always find blanket insulation that fits standard wall stud spacing, and standard spacing for floor joints. In case the area of your home where you will place it is bigger or smaller than standard spacing, you can get continuous rolls, which you can hand-cut and fit in your living space. Blanket insulation is also easy to install so you will not need to ask an expert to do the installation for you. You can choose to get batts or rolls with or without facing. For areas where your insulation is exposed, like your basement walls, you can get batts with flame-resistant facing. The other option in home insulation is blown-in or loose-fill insulation. This type of insulation contains small pellets or loose fibers of fiberglass, foam, cellulose, slag wool and/or rock wool. Sometimes manufacturers also use by-products of batts or rolls in making blown-in insulation. Blown-in insulation easily conforms to any corner it is fitted in, so it is the best type of installation for retrofitting. It is also very good for attic spaces. It has to be installed by a professional, though, because a mechanical blowing machine is needed for the process, hence its name. Foam insulation is made of polyiso, polyurethane or polystyrene materials. Polystyrene foam insulation comes in two forms-- Molded Expanded Polystyrene (MEPS) Foam board or Extruded Expanded Polystyrene (XEPS) Foam board. They differ only in their density consistency. If you are planning to use a foam board made of polystyrene for your roof, choose XEPS because it has better density consistency and is stronger than MEPS. Polyiso and polyurethane foam boards are alike in that they have high R-values or thermal resistance per inch of thickness. Hence, if you have limited space for insulation, you can get thin polyiso or polyurethane foam boards to cover your insulation needs. If you live in a sunny area of the US, radiant barriers are perfect for your home insulation. A radiant barrier, a type of reflective insulation system, prevents a home from accumulating heat gain over summers and from losing heat during winters. They are made of reflective materials, so they prevent your home from absorbing the summer heat. Forms of radiant barriers include reflective chips, reflective foil, laminated roof sheathing and shingles of reflective metal roof. Some have added fibers so they can be easily handled. You can use radiant barriers over blown-in insulation. You need to get an expert to install radiant barriers in your home. To make your use of radiant barriers as home insulation more efficient, you should use it with other reflective insulation systems. You can get batts, boards or molded pipe coverings for rigid insulation. Materials used in creating rigid insulation are fiberglass, mineral wool (rock and slag) or plastic foam. Some have foil facings that reflect solar rays so that heat will not be absorbed by the homes they insulate. Rigid insulation can be bought in batts that fit standard spacing perfectly. Rigid insulation is often used for protecting exteriors such as roofs and foundation walls. Home insulation often requires an inspection if you have a building permit. Consult with your local building department before purchasing any insulation to make sure you do not waste money and your time.